Flaps on a Flite Streak? Control Lines For all you fly-by-wire fanatics! 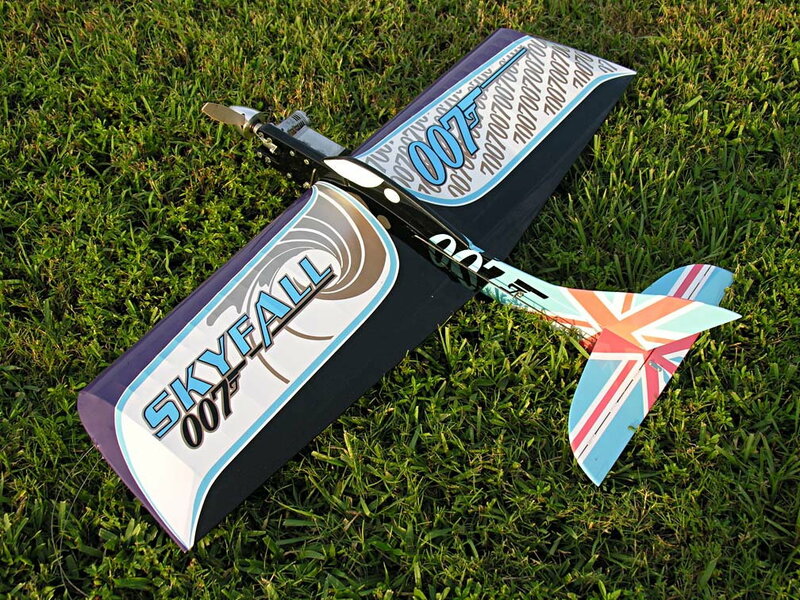 Just wondering, Anybody ever consider putting flaps on a full size Flite Streak? I flew a ARF version today with a OS LA-40 for power turning a 10/6 prop. should be turning tighter loops then it did. Flaps would help! Any thoughts? RE: Flaps on a Flite Streak? I always did it, back in the 70's. Works well. Flite Streak with flaps? of course. They help the turning radius and in my opinion greatly improve its overall flite characteristics. Jan Rummery has plans available for his new version of this old favorite. Much larger wingspan, better construction methods and different airfoil. Jan has many plans available for vintage stunt. Put the flaps on it you should be happy with the improvement. Flight streaks turn tightly as is. With the short tail moments I don't thinks flaps would help all that much. An OLS 40LA? That is a lot of engine and a heavy one at that. Sounds like it is nose heavy. I have used .25's on mine. Some have used hot .15's (norvel's) with good effect. Check the balance point, and make sure it lines up with the instructions. If it dosen't' turn like you like, move the balance point back till it does. Only do this in small increments. For my tastes, I balance it just ahead of the spar. It's nose heavy with the 40. We use various combos-LA 25s, FP 20s, Fox 25s.- and they fly great. Put the 40 in a Pathfinder or a Twister or some such if you want a flapped stunter. What makes it a Flite Streak, tail shape? I've built and flown numerous Flite Streaks - including a Combat Streak w/flaps. What I've found on the Flite Streak platform is they don't really help. The FS was designed as a high performance model without flaps. Furthermore, a model with flaps is also more difficult to trim correctly. You don't need flaps to make a model turn tighter. You use flaps to keep it from stalling when turning. Witness pure combat models. They all turn very tightly but none have flaps. Additionally, I believe your .40 is way too much motor for the FS. My son and I are flying a FS ARF with no flaps and powered by an OS FP 20. We can fly it on 60' lines with no problem whatsoever. With 5 or 10% nitro fuel and a 9-4 prop, the FP 20 hauls our ARF-FS around at 5.1 second laps - plunty fast. Another disadvantage of your .40 it will make the model way nose heavy. Nose heavy planes don't turn well. To balance the heavier ending you'll have to compensate with tail weight. Heavier nose + heavier tail = poorly performing model. a Fox 36. We'll see if there is any difference that way first and go from there. If your CG is forward of about halfway between the spar and the leading edge, you might try adding a bit of tail weight. It sounds like your airplane is way noseheavy. Just checked it again out of curiosity and it's about 1/2" forward of the spar. The Flite Streak's designer, GMA himself, highly recommended not making the flaps on the model movable. The typical stunt flap does add lift, but it also has a tendency to add a bit of nose down action at the same time. Due to the relatively short tail moment arm, making the flaps operable on the Flite streak at least requires setting the elevator to a 2:1 ratio to the flaps. It may work OK, but I'd try adding tail weight first to see if that solves your problem. Additionally (I haven't inspected the Flite Streak ARF carefully), I would ask if you remembered to add a push rod support about halfway between the bellcrank and elevator horn. The instructions may not call for that item, but if the push rod is the typical threaded rod with clevis or even 3/32" music wire, it may be bowing heavily under flight loads. If you don't have that support, I would suggest adding one, especially with that heavy engine, before trying anything else. Oops. Had I looked at the picture you attached, I would have noticed a push rod support and could have skipped my last item above. Sorry. I was into .15-.19's at the time and remember pondering in my LHS over whether I should buy the Flite Streak Jr. at $1.95 or go for the (replacement) Ringmaster Jr. at $1.50 that I came in for...Sigh! A couple of friends suggested the FS Jr. because they had built the full-size one and loved it. I went with the FS Jr.
You won't find many CL flyers using the CA hinges, Bruce. They are stiff, as you noted, and can create some problems when you need to move the surface near its limits. The hinges, combined with the heavy 40 can easily explain the FS's reluctance to turn well. It's best to have the freest possible hinges, either Monokote or pinned, and a really stiff pushrod. Most of us are replacing the pretty light pushrods that come with the ARFs. At least the 4-40 size threaded pushrod or CF. well about 33 years ago i was toying with the idea of a twin engine flite streak using a 19 and 15 size engine for slow combat fiquering i would have 17-20 inches of prop area to cut the streamer.here is a photo of the prototype in 1/2a scrth built from scraps.note the flaps.one thing the flaps made the manuvers quicker but it also slowed me down in the climps.flaps have been used on the fullsize but back then i preferred to use flitestreaks for slow combat. 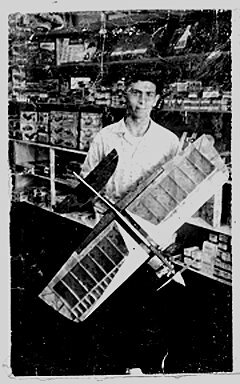 Not only George Aldrich, re: Flite Streak, but Jim Silhavy, author of the Magician, who got "rather annoyed" when he saw one with flaps added. Word is he spoke sharply to such modelers when he encountered them. I've flown Magicians both ways, and found that for sharp and lively corners, he's right! For more precise "stunt" work, the slowing (slight!) caused by flaps helps a consistent flight pattern ..
BTW, did a Magician, Jr.(w/o flaps) in the early 70's on an old-style Fox 15. With 52.5' lines, an 8-4, and wound up to a steady-two setting, it was a delight! No great pull, but no loss of response in any attitude or altitude either. Built light, but strong enough to subdue any vibrations, it's a gem. That was down near sea level; it's a bit different up here near ~5000', but not that much. I never could build a model without changing something. Thing turned on a dime. See if I can find a photo. I built and flew Flite Streaks in the 60's's. Silk and dope, Super Tigre combat 35's on about 15% nitro. Rockets with so much snap it demanded all your attention! Here's my FS of today. Hasn't flown yet because it's for sale. If it doesn't sell, I'll fly it when I get to TN in a few weeks. Yes, you gotta love another FS modeler.